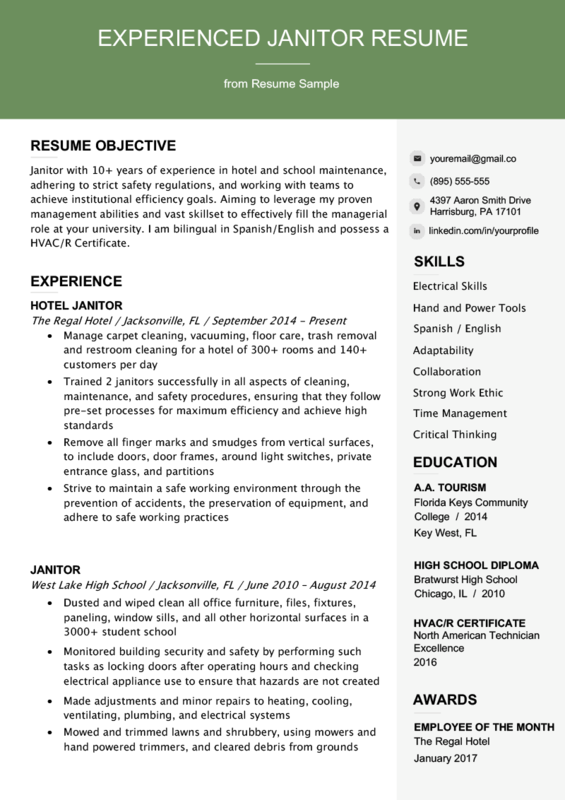 Download and customize our janitor resume example to help you land more interviews. Learn how to clean up your resume and put your best foot forward with our janitor resume writing tips. If you are writing your resume as a professional janitor, you may be hoping to earn more money, transfer jobs, or attain a managerial role. 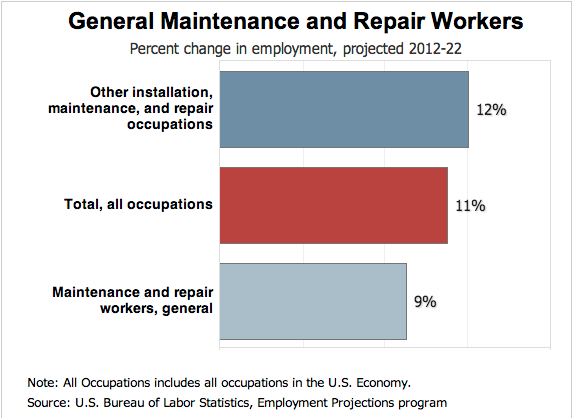 You are in luck, as the maintenance industry is growing faster than national averages. The resume sample on this page is an excellent guide for you to follow when writing your own resume. We recommend that you read our analysis of this resume, so that you can build a professional and effective resume that WILL land you more interviews. Be sure to read our Resume Writing 10 Commandments as a supplement to this guide, to make sure you’re not committing any major resume sins. A well written janitor resume stands out by including key relevant skills (also known as resume builders) that are directly applicable or transferable into the janitorial profession. The applicant has 7 years of experience as a janitor already, and mentions that fact right away, as such a vast amount of experience would immediately grab the attention of the hiring manager. Andy also mentions his HVAC/R certification and bilingual ability, which are very relevant and useful skills for a janitor to have. For more concrete ideas, be sure to read our detailed Career Objective writing guide. The best resumes are achievement oriented. As much as you can, quantify your own resume in the same way. Describe the size and scope of your job responsibilities, or how many people you trained or supervised. It helps the hiring manager grasp the size and scope of your previous duties, and will make your resume stand out. The best resumes are achievement oriented, which you can learn how to do in detail here. In addition, your resume will need to be formatted in one of three formats: reverse-chronological, functional, or combination style. Which format you choose will depend whether your work experience was consistent, or had gaps. Your “Additional Skills” section should only include relevant skills. Andy has many skills relevant to being a janitor — these four in particular. Since you’re a professional janitor, it’s likely that you have developed many skills that can help you find new employment quickly, or help you achieve a higher position elsewhere. Andy even has a certifications section — if you have any, feel free to create your own, too. If you need help brainstorming skills to include check out these popular marketing skills for plumbers. To write a strong resume, your job duties must be described in terms of the skills and abilities you’ve learned to complete those tasks. Find out how to do that here. With regards to the “Educational Section” — if you attended a university degree program or community college program, you should NOT include high school experiences. If you didn’t attend a higher educational institution, then including your high school is appropriate. If you have any questions about how to write a janitor resume, please leave a comment at the bottom of the page. And remember — you can download the resume template at the top of the page, and modify it to match your own experience. Don’t forget to write a janitor cover letter, too! Discover every action verb in the universe here.